Kungfu4less.com offers the best quality Kung Fu shoes to those who participate in the martial art of Kung Fu. Whether you are a student, instructor of Sensei, our shoes will provide you with both comfort and support as you go about learning to master this form of martial arts training. Please note, all shoes are in US Men's sizes. Every sport demands the distinctive use of different body parts. Be it the hands or the feet that are involved, it is important to choose the right kind of accessories needed to be proficient in learning. The shoes used to participate in Kung Fu are literally different from the shoes used in other martial arts. Recognizing the need, Kungfu4less.com has made available the best quality Kung Fu Shoes. Since the nature of the sport is different, the demand on the limbs also differs. Thus, we suggest using the proper shoes while practicing this high demanding martial art. We have a huge range of shoes specially designed to fulfill the purpose of the becoming proficient in the martial art of Kung Fu. The shoe used in Kung Fu is designed in a way, so that it conforms to the shape of the player’s foot. We pay close attention to the superiority of the Kung Fu shoes that we provide to ensure that what we offer, meets the high standards of the sport. 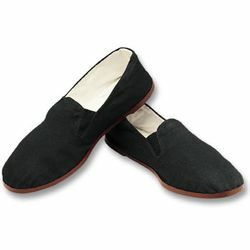 Our shoes are available in various sizes and styles.